I’m with you. I can’t believe that we are so far into summer. I guess this schitzo Boston weather hasn’t helped much (I’m wearing a coat today). Bundled up or not. . .I have been good about doing daily walks and runs (which means exercise twice a day. . .11 miles!). This is great because it enables me to enjoy yummies such as this potato salad. I’m not big on mayonnaise based salads either so I am loving that this has a vinaigrette. And with cherry tomatoes and chives. . .can we say summer heaven? Yum! I much prefer vinaigrette-based potato salads to mayo, too. BUT! I picked up this trick from my local Trader Joe’s actually – if you add a little bit of leftover bbq sauce to mayo (esp. homemade) and for potato salad dressing… omg! It’s insane! Especially their Carolina Gold Mustard-based sauce, hope they carry it in PA! I am on a ROLL with having a sprinkle cone with banana peanut butter chip ice cream (yes, that’s a THING!) for dinner once a week. On a ROLL. Sprinkles are summer, yanno? And I just want to take a fist of that blue cheese and eat it for lunch. DYING. I know what you mean.. on the one hand, summer is flying by, but in some ways I also feel like it hasn’t even started yet! I don’t know how I can feel that way given that it’s felt like ‘summer’ here in FL since about March! Love bacon and blue cheese and potatoes, and can’t go wrong with the gorgeous eggs on top! This is TOO PERFECT! Yummy! I also get sick of seeing mayo based potato and pasta salads, so I LOVE LOVE LOVE THIS! Thank you! I made a potato salad last week with tzatziki instead of mayo and it changed my life – actually. Because mayo makes me want to vom and tzatziki, well, does not. Can’t go wrong with potatoes + bacon + blue cheese. YUM! I love your summer-y list. I am all about doing something every day that I can only do during these summer months. We have been spending so much time at the pool and being active outside. It’s so nice!! These salad looks like the perfect 4th of July side dish. YUM! This looks SO GOOD. Must make! Lovely! 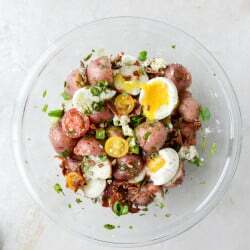 I adore the idea of using soft boiled eggs in a potato salad…yum! This is my kind of potato salad. Complete with runny eggs…those are what dreams are made of! It was this time last year I found out I was pregnant. I am still in shock that it was a year ago. I LOVE the idea of making this with sweet potatoes. Super delish, Jessica. Pinning! Oooh. This looks awesome…Plus I have an abundance of eggs these days thanks to my flock of hens. Happy Summer!!!! This looks amazing!! I’m totally digging the soft boiled eggs and cherry tomatoes. What a great flavor combo. Pinned! Yumm this looks like a perfect potato salad for the 4th!! Cannot wait to try it out :) thanks for the recipe! I would devour this entire bowl BY MYSELF!! I can’t believe I had never thought to put soft boiled eggs on potato salad before! Bah!! So good. This looks so yummy! Quick question – I didn’t see the amount of olive oil to use in the dressing? so sorry! 1/3 cup – fixed it – thanks! How much olive oil? I didn’t see an amount. Thanks! I reallllllly want to make this, but am basically the only blue cheese lover in my life. What other cheese would work? Maybe Feta? Help! definitely feta! even cheddar or gouda! Oh the summer.. indeed, it sails by so fast. I need to make a list too, as those long walks are not as frequent as I want them to be. Thanks for the nudge! This potato salad, Jessica! Delicious flavors and those eggs?! I am a fan of creamy mayo potato salad, but also of non mayo types too… and this one does it for me! Those herbs, eggs, blue cheese!? What’s not to like! ? This should be at every picnic!!! And I’m mega jealous of your “overflowing mint”! Mine is on it’s last leg. booo. I could stare at this picture every day! Yum!! This is soooo good. I added a few bbq roasted ears of corn from Evans City. Yum. I might eat it all before my picnic tomorrow! 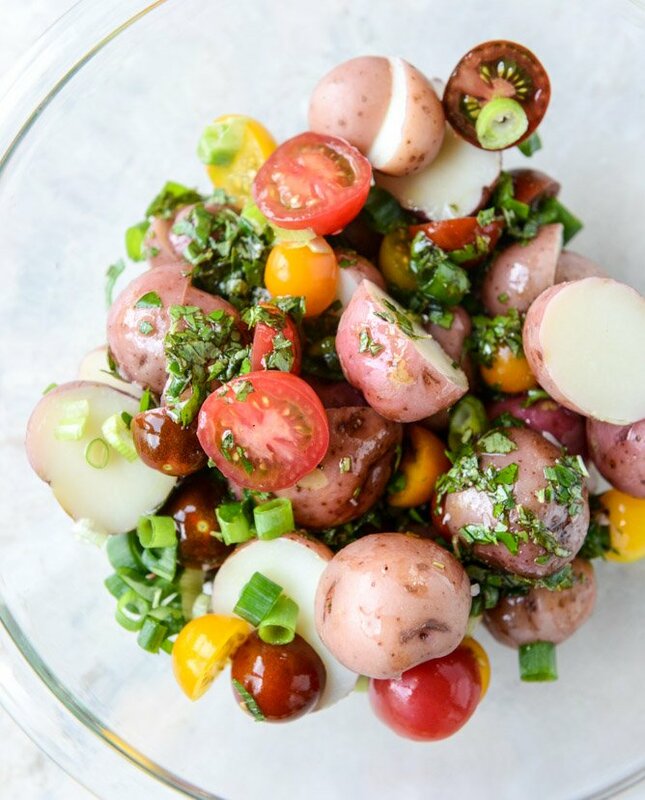 I made this potato salad for friends and family this 4th of July and it was a HIT! I’ve been more of an observer of your posts for a while but knew I had to try this potato salad. Everyone loved the soft-boiled eggs, the vinaigrette was AMAZING with all of the herbs, and the blue cheese just took it to another level. Thanks so much for posting! 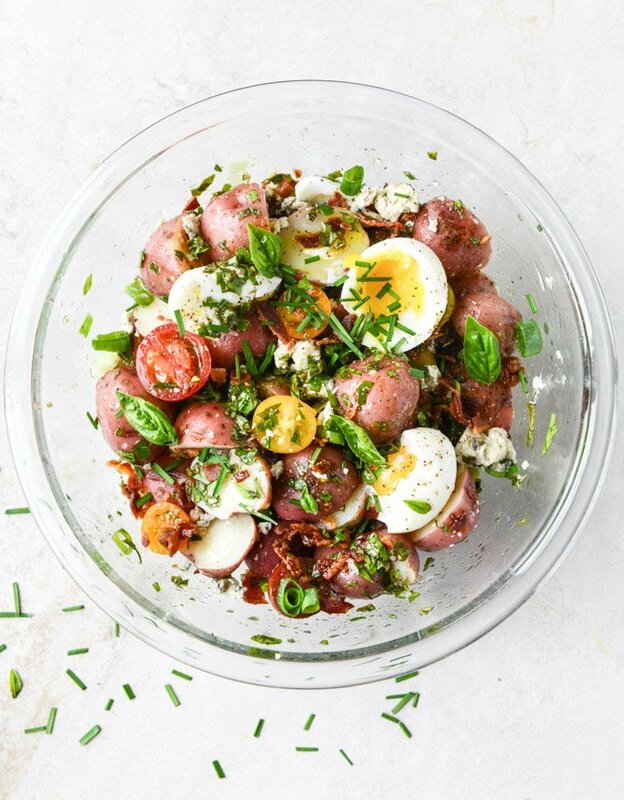 This will definitely be my new go-to for potato salads. I think I could get into this. I’d personally pick out the tomatoes, but anything with a runny egg yolk, and I’m in. Especially if there is also bacon and blue cheese, so basically I’m like 90% in love, which is more than enough for me to give this a shot. Looks amazing! a Bon Appetit recipe I have made for years,.